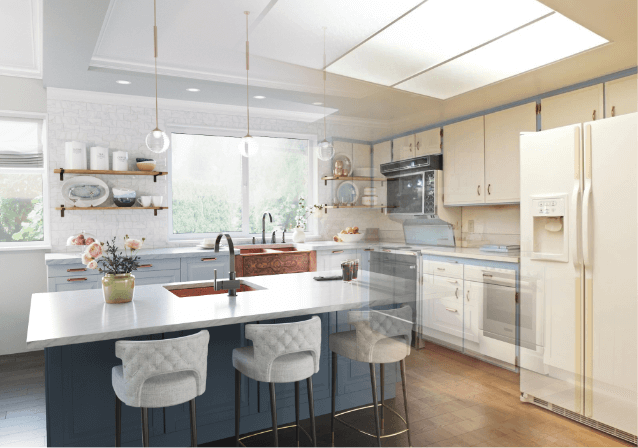 The general rule of thumb is to spend no more than 15 percent of your home’s current market value on a kitchen renovation. Set aside 20 percent of whatever that number is for unplanned expenses. Remember, in the end, a well laid out kitchen with neutral tones and classic style will increase your home’s market value. Finding the right contractor and designer is the most important step, so take your time with it! Be sure to look at their past work, ask for references, and be very clear with what you want from the start. Having to alter plans as you go is risky and can waste a lot of time and money. Never pay more than 30 percent upfront to cover startup materials, then work out a schedule of payment installments after each successfully completed task. Together with your designer, create a kitchen layout that has distinct zones. One of the best known principles of kitchen design is to create a triangle with the sink, oven, and refrigerator, each with counter space and storage surrounding them. Having the fridge nearest to the entrance of the room is best, since that is often the only reason people come into the kitchen. A sink or stove should be in the center of the room for proper entertaining. If you have a dark or small kitchen, simply adding more light can make a big difference. When picking out appliances, look for items that will be the easiest to clean and that work best for your lifestyle. A lower price tag does not necessarily mean lower quality; it might just be a more straightforward product without all the bells and whistles. Make sure to order all your appliances and materials well in advance. Check everything as it comes in to make sure that it is the right item, the right amount, and not damaged. One of the most overlooked things about home renovation is product storage. Once materials are ordered, they tend to come in slowly and out of order. Plan out a space, such as the garage, a spare room, or even the back porch. Wooden products such as cabinets should be kept in a heat and moisture controlled environment to keep the wood from becoming damaged. Another important thing to consider is setting up a temporary kitchen. A microwave, a dorm stove and mini fridge can be set up in a spare bedroom, basement, or the garage for cooking meals during the renovation. We hope that these tips come in handy during your kitchen renovation. Be sure to check out the wide variety of kitchen sinks and faucets that we have to offer. With reasonable prices, fast shipping, and excellent customer service, an MR Direct sink can be the jewel of your new kitchen!